Investors have long understood that globalization has changed a number of opportunities. It’s even questionable as to whether global diversification helps a portfolio since there is a rising degree of correlation among stock markets around the world. This is especially true among industries. And, that creates potential insights into the state of certain industries in the U. S. stock market. For example, airlines are affected by economic activity and that is true in every country. Strong economic growth should result in an increase in the demand for air travel and weakness in the economy should result in at least some diminished demand for travel. That means looking at earnings reports for airlines in developing economies could lead to early insights into global economic growth. It is relatively simple to monitor growth in Latin America since a number of companies from that region are traded on the U. S. stock exchanges. One example is Copa Holdings, S.A. (NYSE: CPA). Copa provides airline passenger and cargo service through its principal operating subsidiaries, Compania Panamena de Aviacion, S. A. (Copa Airlines) and AeroRepublica, S. A. (Copa Colombia). The company operates through air transportation segment. Copa Airlines operates from its position located in the Republic of Panama. Copa Airlines provides international air transportation for passengers, cargo and mail, operating from its Panama City hub in the Republic of Panama. Copa Colombia provides service within Colombia and international flights from various cities in Colombia to Panama, Venezuela, Ecuador, Mexico, Cuba, Guatemala and Costa Rica. With these routes, the company is an indicator of economic activity in Central America. When CPA announced earnings recently, Zacks reported the company “put up a disappointing performance in the third quarter of 2018 with lower-than-expected earnings and revenues. The company’s earnings per share of $1.36 missed the Zacks Consensus Estimate of $1.42. Moreover, the bottom line plunged significantly year over year. Results were hurt by high fuel prices and weakening Brazilian and Argentinian currencies. There were additional signs of trouble in the earnings report. Key operational indicators for airlines all fell. From the earnings analysis, investors learned,“While passenger unit revenue per available seat mile (PRASM) slipped 4.8%, yield per passenger mile dipped 3.3%. Passenger traffic (on a consolidated basis) rose 4.8% and capacity was up 6.6% in third-quarter 2018. Load factor contracted 140 basis points to 84.3% as traffic rise was outweighed by capacity growth. Additionally, unit revenue per available seat mile (RASM) slid 4.2%. Operating cost per available seat mile (CASM) rose 4.3% in the reported quarter, primarily due to higher fuel costs. These trends could have been troubling investors for some time and the stock price does reflect that investors have been concerned about the company for the past year. The long term chart shown below indicates the stock has been in a down trend for months. But no stock goes straight down. The recent price action indicates that a small consolidation has formed, the first one in several weeks. This could attract buyers, hopeful that the stock decline is ending. Income investors could also be buying the stock’s 4.6% yield. While the down trend is likely to resume, the short term opportunity is for the bulls, as long as risks are managed. 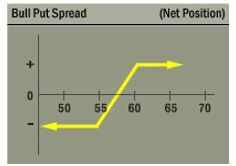 For CPA, a bull put spread could be opened with the December 21 put options. This trade can be opened by selling the December 21 $85 put option for about $5.95 and buying the December 21 $80 put for about $3.20. This trade would result in a credit of $2.75, or $275 per contract since each contract covers 100 shares. That amount is also the maximum potential gain of the trade. The maximum possible risk is the difference between the exercise prices of the two options less the premium received. For this trade, the difference between exercise prices is $5 ($85 – $80). This is multiplied by 100 since each contract covers 100 shares. Subtracting the premium from that difference means, in dollar terms, the total risk on the trade is then $225 ($500 – $275). The potential gain is about 122% of the amount of capital risked. This trade will be for about one week and the annualized rate of return provides a significant gain.